There is increasing evidence that a number of different chronic conditions are associated with the development of cognitive impairment and dementia. The Dementia and Chronic Conditions Series Toolkits are designed to improve support for people living with cognitive impairment or dementia and other chronic conditions. These resources will assist people working in the community, partners, families and carers to provide better support to the person in areas such as diagnosis of dementia and on-going management of their health. The development of these toolkits is jointly funded by the Commonwealth and Victorian Governments under the HACC program. In 2013 Dementia Australia Vic commenced work on the first two toolkits in this series: the HIV and HIV-associated neurocongitve disorder (HAND) toolkit and the type 2 diabetes and dementia toolkit. The toolkits include a manual for people working in a community setting, a consumer information booklet and individual support tools. HIV stands for human immunodeficiency virus. This toolkit is about medical conditions associated with HIV, known as HIV-associated neurocognitive disorders (HAND). HAND affects cognitive (thinking) abilities such as memory, language, attention, concentration, planning, judgement and organisation. This toolkit is for paid and volunteer workers in community care settings who support people with HIV. The toolkit provides information to increase knowledge and understanding of the cognitive issues of HIV and their impact on self-care. It helps workers identify and address these issues to support better health outcomes for people with HIV and HAND. The HIV toolkit and associated publications are available for download by clicking on the links below. This toolkit relates to two chronic conditions, diabetes and dementia. These conditions can occur separately and together, and are common in older people. Research also shows that having diabetes increases the risk of a person developing dementia. People who have diabetes are required to undertake many self-care activities. Dementia, a condition which affects thinking, behaviour and the ability to perform everyday tasks, will affect performance of diabetes self-care activities. This toolkit is for paid and volunteer workers in community care settings who support people with diabetes and dementia. The toolkit provides information to increase knowledge and understanding of the link between diabetes and dementia and the impact of dementia on diabetes management. It helps workers identify and address these issues to support better health outcomes for people with dementia and diabetes. 1. What is Dementia and Diabetes? This toolkit relates to three chronic conditions, dementia, stroke and coronary heart disease. A combination of dementia and stroke or coronary heart disease can result in a unique set of challenges for people living with these conditions and their carers. All three conditions have similar risk factors meaning it is not uncommon for a person to be living with more than one of these. This toolkit is for paid and volunteer dementia care workers in community care settings who support people with dementia and stroke or coronary heart disease. The toolkit provides information to increase knowledge and understanding of the link between these conditions and the impact of dementia on the management of these conditions. It helps workers identify and address these issues to support better health outcomes for people living with dementia and these chronic conditions. The Consumer Information Booklet helps to inform the person living with dementia, their families and friends, on how to make the most of life with these conditions. Fact Sheet 2: What are some non-verbal signs of pain? 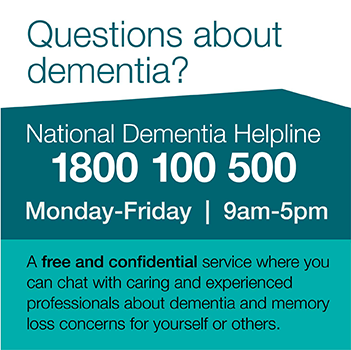 See the videos below for information on dementia and stroke or coronary heart disease, encompassing general information, information for healthcare providers, and information for family and friends of people living with dementia.